While when they happen messes are not something you laugh at, messes do tend to stay in your memory. I still remember the time I spilled a whole container of hot homemade potato soup all over my kitchen floor. As I was cleaning up the sticky, starchy mess, I was far from laughing. In fact, I may have said some words that were not particularly laughable. Given time, stories about messes do bring about laughter. One Thanksgiving, my mom tripped while carrying a bowl of corn. The corn flew up into the air, up on the ceiling, and fell all over the floor! We joke that there is still corn stuck to that kitchen ceiling. It is a wonderful memory of my mom that we tell again and again. I’m pretty sure, however, that it was a while before Mom could laugh at herself over spilling all that corn! Some of the more messy messes are made by the little ones in our lives. A baby just learning how to eat solid food (which really isn’t all that solid–mashed banana, for instance) seems to get more banana on her clothes, the high chair, and the floor than actually in her mouth! I never realized how much banana stains clothes until I had a baby. The most fun messes are the planned messes; the messes that come with a special event such as a birthday. For Lily’s second birthday, she wanted a “doggy” themed birthday party. 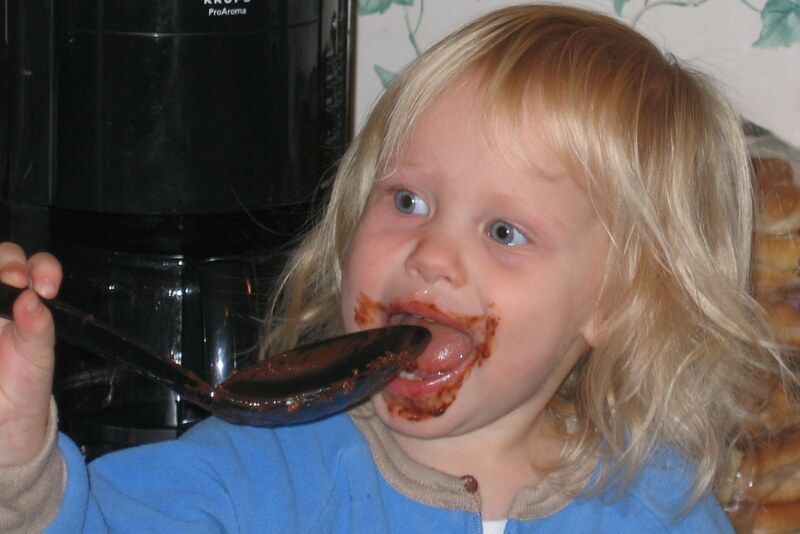 I melted some chocolate to make some bone shapes for her cake, and I let Lily lick the spoon. Lily really enjoyed making that chocolatey mess, and I enjoyed watching her make it! That's what everyone loves about the first birthday so much too! She looks so darn cute! What a sweet photo and memory. I agree that most often we can laugh about the messes later. We have had some good ones over the years. Chocolate messes are the best.Great cake! You have such a great perspective!And, yes, birthday messes are always welcome! She is PRECIOUS! What an adorable mess to have. Your daughter is absolutely precious! Thanks for stopping by on my SITS day!